The HexaBeam is the most pure and simple representative of The Magic Crystals family. It's parts can be used in combination with pieces from any other family member. In fact, parts of all it's relatives are made by cutting off some material from the HexaBeam parts. To assemble it you have to put together two groups of parts consisting of three pieces each. 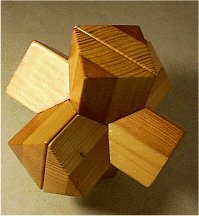 The HexaBeam has a hollow cube shaped cavity inside of it, so to some extent it's a Box Puzzle.